This is a tall (up to 100cm) perennial grass species that produces a soft, cylindrical, spike-like head in late April or early May. It occurs throughout Ireland being most abundant in low-lying areas and especially in old grasslands on rich, moist soils. 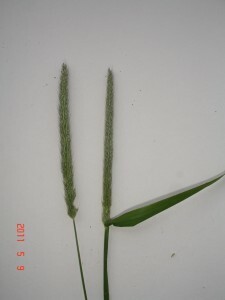 It closely resembles Timothy (Phleum pratense) and the two species can only be distinguished on the basis of minor anatomical differences in the head. Although it is not regarded as a valuable species in amenity grasslands such as sports pitches or golf courses it has some agriculture value because it commences growth very early in the year thus providing valuable forage at a time of year when other grasses are not available. It also has some interest as an ornamental plant. Wholly yellow varieties and varieties with leaves striped green and yellow have been bred for garden cultivation. It is one of the earliest heading grasses at Castlewarden and its foxtail-like heads are the first seed heads to be seen in many of the off-fairway areas of the course. It grows abundantly in the rough at the front-left of the 17th tee box and in the rough/spinney at the back of the 14th tee box.